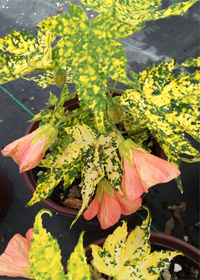 Brilliant gold and green splashed leaves offset salmon flowers flushed orange for most of the year. Stunning container specimen which will also do well indoors during the winter months. 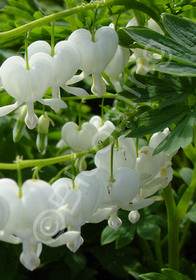 This old-fashioned perennial favorite has large, arching stalks of pure white heart-shaped blooms that are set on light green foliage in late spring. Perfect for cottage and woodland gardens. May go dormant in summer. 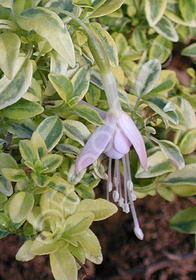 Pendulous soft pink bells grace green leaves edged in creamy-yellow. 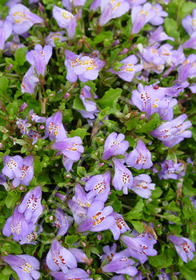 This eye-catching cultivar has an exceptionally graceful growth habit, semi-prostrate when young but more upright with age. 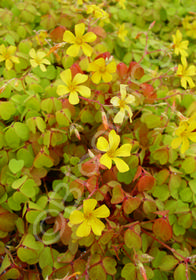 Clear lemon-yellow flowers bloom above golden-orange-to-bronze foliage in spring and summer. The foliage takes on deeper bronze-pink tones in cool temperatures. 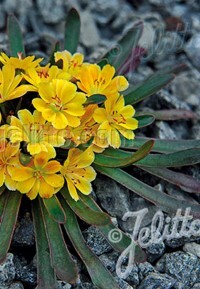 Small, evergreen rosettes of large, succulent leaves become covered by clusters of yellow-orange mango colored blooms in spring. 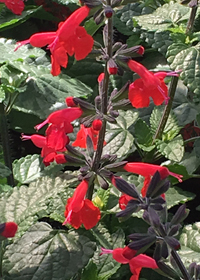 Excellent in containers, the border or a rock garden. 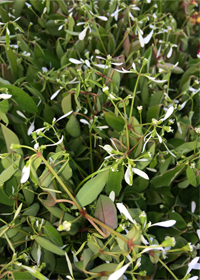 White clouds of wispy flowers Spring-Fall above attractive clover-like foliage. Perfect for Containers. Very free-flowering and low-maintenance. 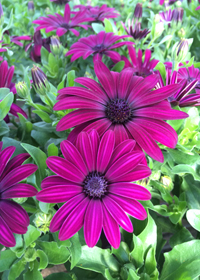 Eye-catching African Daisy with its brilliant dark purple color blooming in the summer and fall. Attracts bees and beneficial insects. Copious bright red flower spikes set the garden ablaze from spring to frost! One of the best for attracting hummingbirds! Bounces right back after heavy rains or winds. Huge white blooms of Giga proportions! 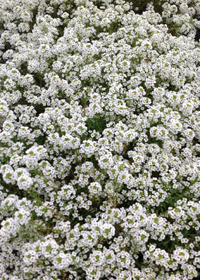 This selection produces the largest flowers of any Alyssum available and also has great branching on compact plants! Perfect for containers! 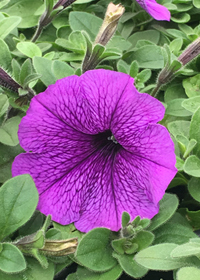 An excellent petunia for color and mounding habit, 'Purple Sky' has gorgeously rich purple blooms with a darker purple netting that contrasts well with the dark green foliage. Combine with gold flowers and foliage for a regal look!